Four women. One man, five stories that interweave, overlap, cross over and come together as the characters speak their lives to the reader and to each other. Five characters in search of themselves in different contexts, from different backgrounds, trying to connect across a chasm of loneliness and disappointment. 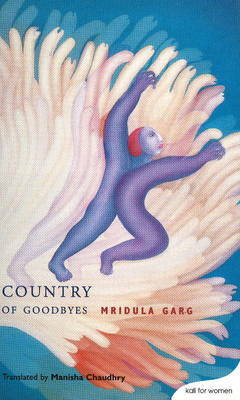 Mridula Garg original Hindi novel, "Kathgulab", available in English for the first time, seethes with disquiet. No permanent solutions, no abiding relationships, just the seeking self. Hailed as a work of extraordinary power and vigour when it was published, "Country of Goodbyes" is unrelenting in its probing astringent in its delineation of women trying to break free. It is unusual and gripping.